^ WATSON, Prof. James Dewey. Who's Who（英语：Who's Who (UK)） 2015 online Oxford University Press. 布盧姆斯伯里出版公司旗下之A & C Black. “All text published under the heading 'Biography' on Fellow profile pages is available under Creative Commons Attribution 4.0 International License.” -- Royal Society Terms, conditions and policies. [2016-03-09]. （原始内容存档于2015-09-25）. ^ Anon. 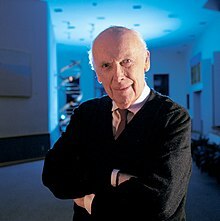 James Watson EMBO profile. people.embo.org. Heidelberg: European Molecular Biology Organization. 1985. ^ Copley Medal. Royal Society website. The Royal Society. [2013-04-19]. ^ Capecchi, Mario. On the Mechanism of Suppression and Polypeptide Chain Initiation (PhD论文). Harvard University. 1967. ^ 6.0 6.1 6.2 6.3 6.4 Chemistry Tree - James D Watson Details. academictree.org. （原始内容存档于2015-01-22）. ^ Steitz, J. Joan Steitz: RNA is a many-splendored thing. Interview by Caitlin Sedwick. The Journal of Cell Biology. 2011, 192 (5): 708–9. PMC 3051824. PMID 21383073. doi:10.1083/jcb.1925pi. ^ Hopkin, Karen. Bring Me Your Genomes: The Ewan Birney Story. The Scientist. June 2005, 19 (11): 60. ^ Anon. Richard J. Roberts - Biographical. nobelprize.org. 1993 [2016-02-28]. （原始内容存档于2016-03-04）. ^ Ferry, Georgina. EMBO in perspective: a half-century in the life sciences (PDF). Heidelberg: European Molecular Biology Organization. 2014: 145. ISBN 978-3-00-046271-9. OCLC 892947326. （原始内容 (PDF)存档于2016-08-24）. ^ Ferry, Georgina. History: Fifty years of EMBO. Nature (London). 2014, 511 (7508): 150–151. doi:10.1038/511150a. ^ Watson, James D. (2001). A Passion for DNA: Genes, Genomes, and Society. Cold Spring Harbor, N.Y.: Cold Spring Harbor Laboratory Press. Page 3. ^ James Watson, Francis Crick, Maurice Wilkins, and Rosalind Franklin. Science History Institute. 2016-06-01 [2019-01-15] （英语）. ^ Edward Osborne Wilson. The Molecular Wars. Island Press. 1994 [2018年12月29日]. ^ Watson, James D. (1999). The Double Helix. Penguin Books. Page 175. ^ Cold Springs Harbor Laboratory. October 18, 2007. Statement by Cold Spring Harbor Laboratory Board of Trustees and President Bruce Stillman, Ph.D. Regarding Dr. Watson’s Comments in The Sunday Times on October 14, 2007 页面存档备份，存于互联网档案馆. Press release. Retrieved October 24, 2007.